Madurai is a major city and cultural headquarters in the state of Tamil Nadu in Southern India.It is the administrative headquarters of Madurai District. Madurai is the second largest city by area and third largest city by population in Tamil Nadu. Its located on the banks of River Vaigai, The city is referred by various names including "Madurai", "Koodal", "Malligai Maanagar", "Naanmadakoodal" and "Thirualavai". Madurai is built around the Meenakshi Amman Temple, which acted as the geographic and ritual center of the ancient city of Madurai.The city is divided into a number of concentric quadrangular streets around the temple .Madurai is hot and dry for eight months of the year.It is a major cultural and educational center in southern India. It is also known as the Temple City because of its many temple complexes. Madurai is surrounded by several mountains. The Madurai city has 3 hills as its city boundary. Yanaimalai, Nagamalai, Pasumalai named after Elephant, Snake and Cow respectively. It is famous for Jasmine Flowers. Jasmine flowers are transported to other cities of India from Madurai. It is narrated in legend that Madurai was originally a forest known as Kadambavanam. CHITHIRAI THIRUVIZHA in Meenakshi Sundareshwarar Temple (Commonly known as Meenakshi Amman Temple) is one of the most famous celebrated festival in MADURAI .This is celebrated between April and May during the Tamil month of Chithirai. People from all the villages in and around madurai will join in this festival. Meenakshi Kalyanam is truly one of the most popular festivals of Madurai that attracts visitors in large numbers, not only across India but from other counties as well.This festival will take a period of 12 days. The festival commences from the second day of the lunar month that is exactly two days after the new moon. This festival say a short story . Wedding of Goddess Meenakshi and Sundareshwarar will take place in the absence of meenakshi's brother , Lord Azhagar (Perumal ) . Lord Azhagar will be engaged by his devotees in Azhagar malai at the time of marriage . Hence , he will be late for marriage . On hearing the news of marriage without his presence , he gets angry and returns to his place , Azhagar Koil . On the way to the temple , he crosses River Vaigai . This occasion is celebrated as Azhagar Aatril Erangum Vaipogam . Lord Azhagar will get into vaigai in golden horse . Lot of devotees will assemble in river vaigai to watch this occasion . Azhagar reaching Azhagar Koil is the last day of the festival .On the day of wedding , free wedding feast will be arranged for the devotees in the temple. Most of the people in madurai will have their lunch in temple. Wedding of Meenakshi and Sundareshwarar is considered to be their own family wedding and they will prepare wedding feast in their home which inclues Rice, Sambar , Rasam , Payasam , Vadai , Paniyaram/Appam , Curd , Appalam and Pickle. The Meenakshi temple is at the heart of Madurai, with the main streets spreading out as concentric squares around it. 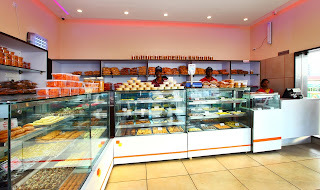 Most of the important shopping and eating joints are in the temple area. 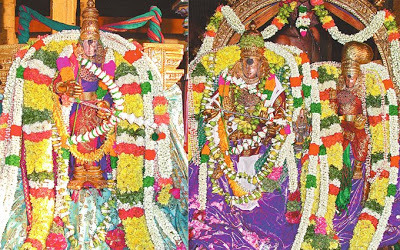 In the evening , Goddess and Lord will be decorated with lot of fragnance flowers and will be taken in a car through all the four masi streets . People will gather there and enjoy their god The spiritual ambience is heightened with the offerings made by the devotees like jaggery and coconut.The next day is Azhagar Aatril Erangum Vaipogam . On the same day evening , Lord Azhagar will be decorated with flowers and bless the people in and around Vaigai river and have a stay in Lord Varadahraja Perumal Temple ,near Tallakulam at night . The next day,Lord will be moving to Azhagar Koil . During this journey , lot of devotees will accompany him from Madurai to Azhagar Koil , few kilometres from the city , leave him and then return back . The last 12th day is the Theertha festival . Goddess and Lord will have a ride in masi streets . Madurai has always been a city of commerce.Today, Madurai’s food is a happy union of all these influences, mainly that of Chettinad cuisine, known for its fiery flavours. 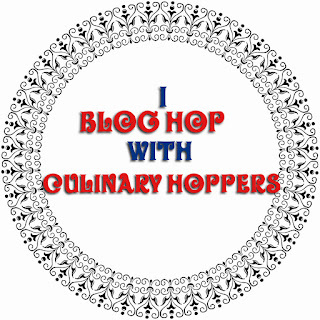 The Chettinad story is seen in the rice-based snacks like paniyaram and idiyappam . The city is hailed as the food capital of the State with hundreds of eateries thriving its streets for Centuries. Though star hotels and niche restaurants have also mushroomed in the Temple Town, true-blue Maduraiites never miss to pause and have a bite by the footpath. The food they serve is as good as mom’s cooking. Evening Mutton Stall is known for its Elumbu roast and a slew of spicy gravies. Some specific hotels offers over 40 different types from tangy garlic or spicy mushroom stuffing to sugar glazed sweet dosas. Madurai’s street-side eateries are synonymous with idli shops and parotta stalls that dot the town. After sundown, idli counters spring up along the streets. 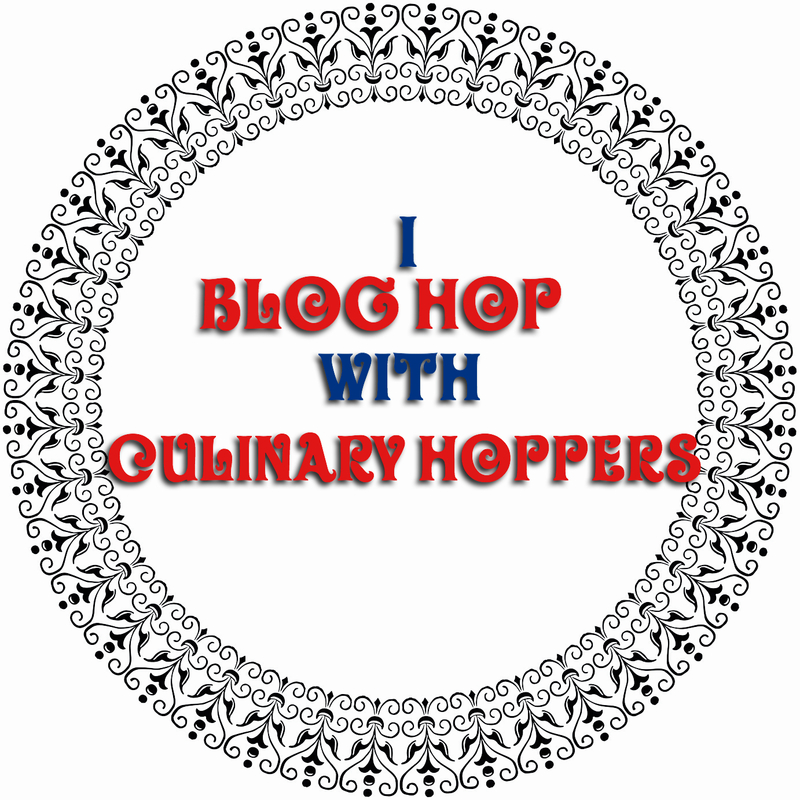 “Idli is the comfort food for all age groups.The kitchen is out in the open and one can see what goes into the making of the food and it’s served hot and fresh off the stove. One also doesn’t have to wait for long. Roadside eateries have been one of the main reasons for Madurai getting the tag of Thoonganagaram (the city that never sleeps)! Madurai is also inordinately fond of fried snacks and halwas too.One of the main properties of Madurai cooking is that masalas are used in abundance and always ground fresh. As a temple and trading city, Madurai takes its sobriquet of ‘thoonga nagaram’ (the city which never sleeps) very seriously. 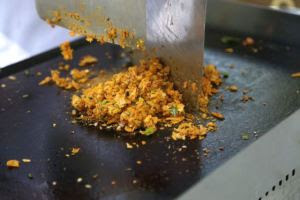 During midnights, street stalls resound with the clang clang of kothu parotta being chopped up and special Madurai biryani being ladled out by the platefuls for the thronging locals and tourists alike. Madurai is known for its food from the “mess”, local eateries serving home cooked non-vegetarian food. Rice is present at every meal in Madurai, either as plain white rice, or flavoured rice such as lemon rice, puliyodharai, tomato rice and biryani, or in the form of idli, dosa, paniyaram, appam or idiyappam. The favoured rice, even for biryani, is the local Ponni and not Basmati. 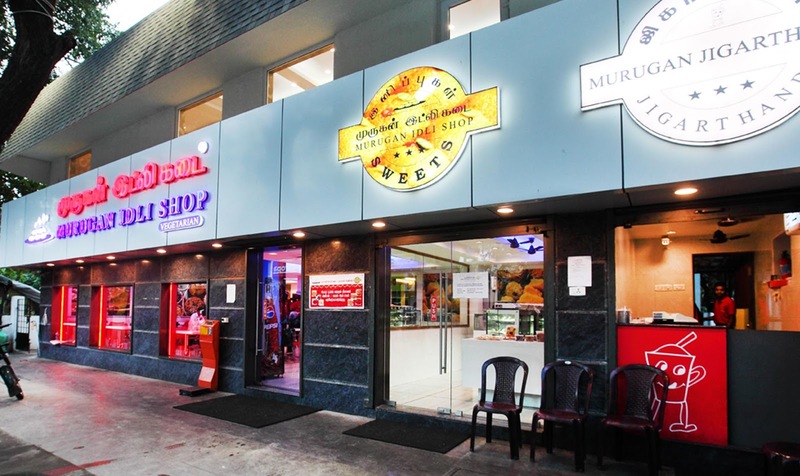 Madurai Idli Shop is a mandatory pit stop for visitors to this city, with idlis that are said to be as soft as Madurai’s famous malligaipoo (jasmine). 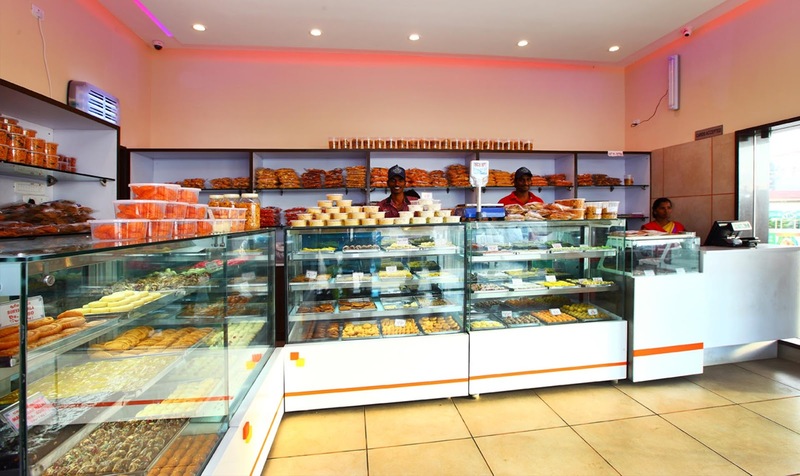 They have both ambience and taste, reflecting the authentic South Indian dishes. I love enjoy sharing my hometown with all of you and recommend if possible you guys to go there and enjoy your food...Yummm taste...Dont miss my hometown foods. The Culinary Hoppers have decided Bengali Cuisine for this month.Actually this cuisine is completely new to me but I started liking the taste of Bengali dishes.This recipe is a very typical Bengali recipe. This one is slightly harder to cut, but the nicest thing is that it has far less seeds compared to the pumpkin. While the pumpkin is like a big hollow, the butternut squash is chunky all the way through till the bottom rounded bit which has all the seeds- in short, less messy. Not only is it a good source of fiber, but it is bursting with the goodness Vitamins A, C and E. Pumpkin is also called kumro in Bengali. 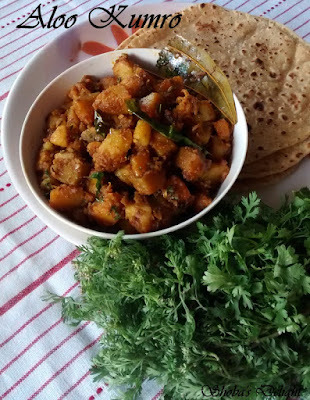 This dish is slightly on the sweeter side and is ideal with roti/paratha. This dish is quite a standard one using usual spice combinations. Method 1. 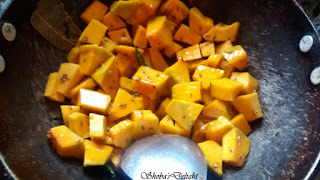 Peel and cut the potatoes and pumpkin/ butternut Squash into cubes. 2. Heat oil in a pan. 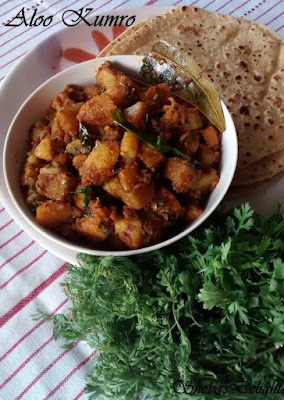 When hot, but but steaming hot, add in the bay leaves, chilies, cumin seeds and asafoetidaThen add grated ginger followed by the dry masala powders. 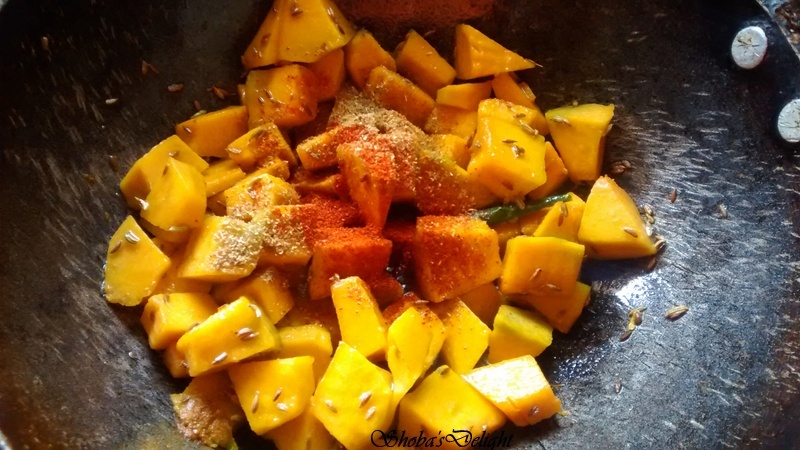 Put the potato pieces with little salt and little turmeric powder into the oil and fry till it become little brown in color. 3. Add the turmeric, chili powder, coriander powder and salt. Mix well. Add the ginger. Add in the pumpkin. Mix well. Put 1/2 cup of water into the pan and close the lid of the pan and cook till vegetables are fully cooked. Cover and cook on a medium fire for about 10 minutes. The potatoes and pumpkin both cook around the same time, especially if it is the butternut squash. Red Indian pumpkin tends to cook a little faster. 4. Try breaking the potatoes and pumpkin with your ladle. At last put 1/2 teaspoon garam masala and 1teaspoon ghee into the pan and cook for 2-3 mins. I prefer not to overcook the pumpkin, because it then mushes up.